This was a fantastic weeknight meal, pretty much no prep, quick and full of flavour. Remember to get all of your ingredients if you want a truly 15 (or 20) minute meal. I nailed this one in 20 but oh my gosh you should have seen the state of the kitchen! Poor OH with the clean up. Watch out for cayenne pepper.. much hotter than chilli powder!!! I used quite a lot so the fish had a definite kick! I loved the yoghurt tartare though, very different and helped balance the heat. Put the baps into the oven, slice the potato 0.5cm think, put it into the small pan, cover with boiling water and the lit and bring to the boil. 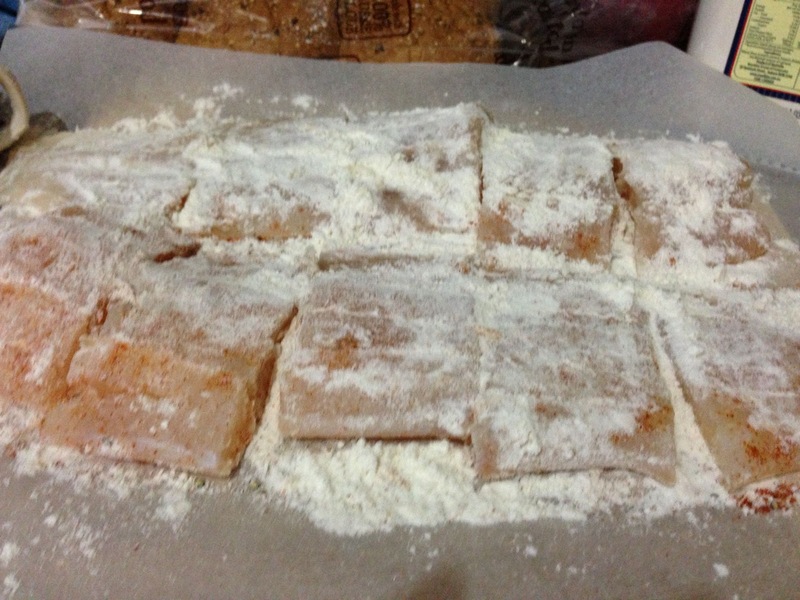 On a sheet of greaseproof paper, season the fish with salt, pepper and cayenne, then sprinkle over flour to coat. 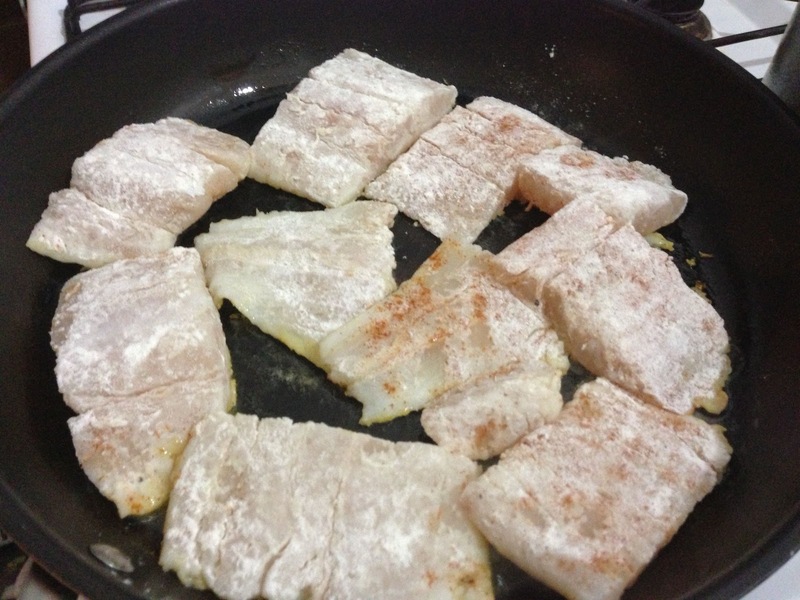 Pour 2 tablespoons of oil into the frying pan and add the fish. Cook until golden, finely grating the Parmesan over the top when you flip it over. Top the frozen peas into the pan with the potato then rip in the leafy top half of the mint and replace the lid. Put the cornichons, capers, lettuce and yoghurt into the processor. Tear in the top leafy half of the parsley, squeeze in the lemon juice, then whiz up, season to taste and pour into a bowl. Drain the peas and potatoes, puree in the processor and season to taste. 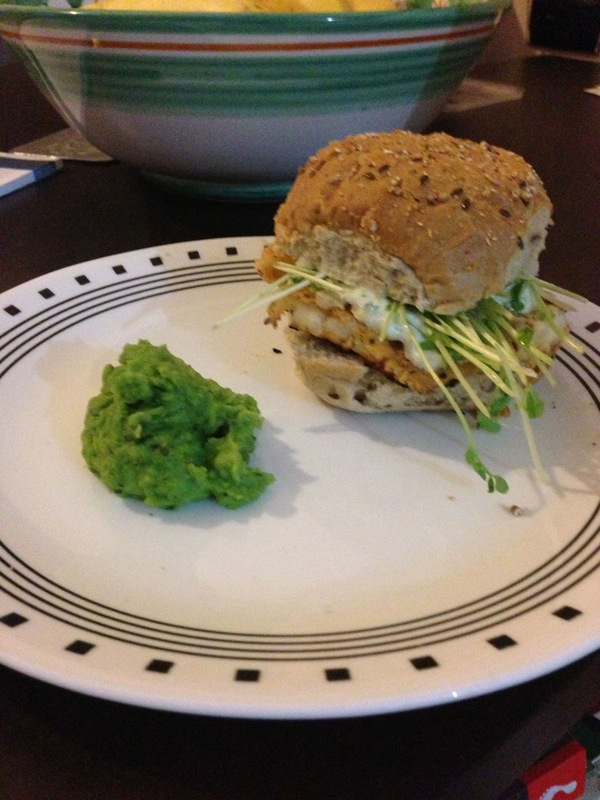 When the fish is perfect, get the baps out of the oven and serve with the peas, tartare sauce, punches of cress and lemon wedges. Results: Great! Nice and light meal, pretty healthy and so tasty! The peas were fantastic and will be something to incorporate a lot more in dinners, very quick. Fish was delish although I underestimated the potency of cayenne pepper.. lucky I can handle the heat! Thanks Amateur Cook it was so very easy, cheap and yummy!